The Council to provide a platform for regular consultation between the Government and business community on matters related to private sector investments and push forward industrial cooperation under CPEC. 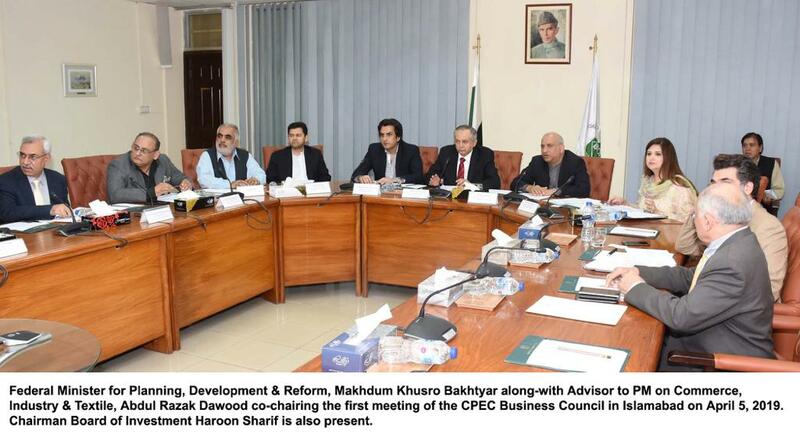 ISLAMABAD, April 5 , 2019: Federal Minister for Planning, Development & Reform Makhdum Khusro Bakhtyar along-with Advisor to PM on Commerce, Industry & Textile Abdul Razak Dawood co-chaired the first meeting of the CPEC Business Council here in Islamabad on Friday. Speaking on the occasion, Minister for Planning said that purpose behind establishing the forum is to create an interface between the Government and business community and take forward the industrial cooperation between Pakistan and China to new heights for mutual benefit. Through industrial cooperation, we also want to address trade imbalance, broaden market access for agricultural products and encourage B2B cooperation between the two countries, stated the Minister. 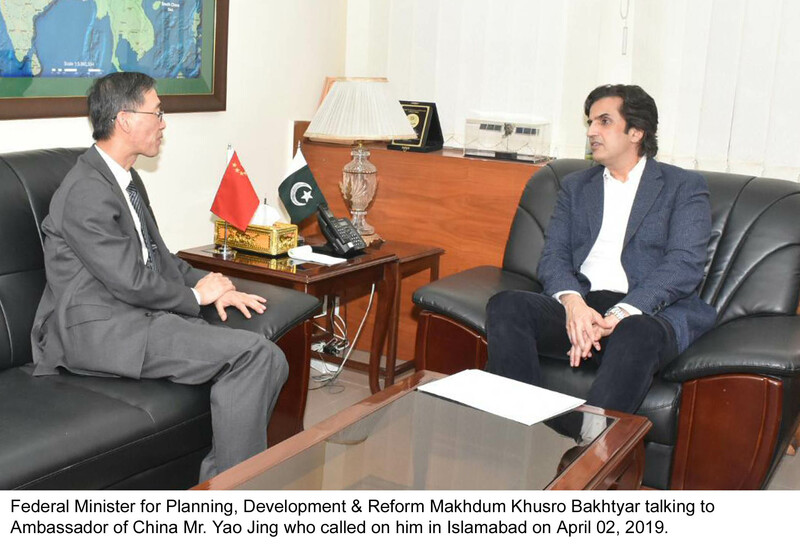 Makhdum Khusro said that scope of CPEC has been expanded with focus on industrial and agriculture cooperation, socio-economic development, trade and market access. The Minister expressed optimism that creation of CPEC Business Council, with representation from private sector leading associations and companies in various areas, will accelerate the pace of industrialization under the umbrella of mega project. 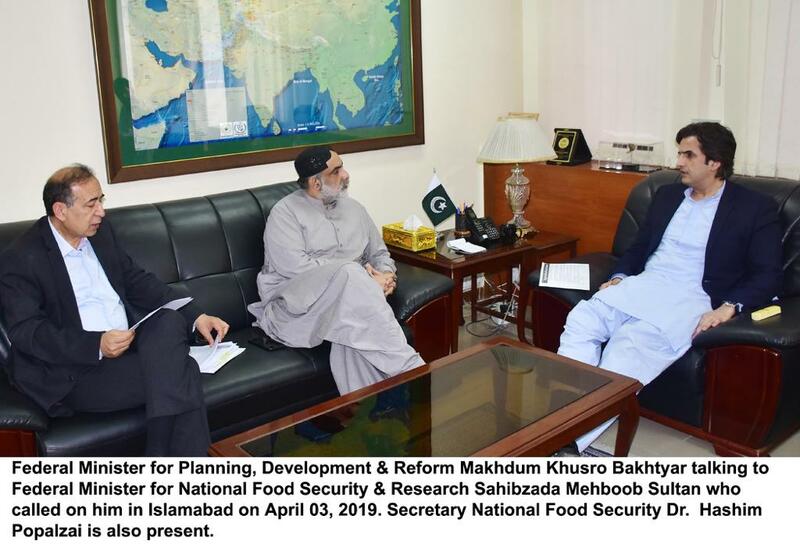 The Minister said that focus is to boost Pakistan’s industrial capacity through joint ventures in priority areas, relocation of labor-intensive export led industry, SME’s collaboration and enhance vocational training capacity. Advisor to PM Abdul Razak Dawood said that after implementation of early harvest projects of energy and infrastructure under CPEC, the stage is now set to expedite the industrial collaboration which will help to attract private investments and diversify the country’s exports. He added that we are in the second phase of CPEC where industrialization and agriculture growth would be the main goals of the current regime. Special Economic Zones (SEZs) have been the engine of growth for many developing states around the world for the last few decades and it’s the high time for Pakistan to convert its SEZs into growth hubs. The Advisor hoped that SEZs would attract investment from diversified sources because they offer a combination of tax-and-tariff incentives, streamlined customs procedures and less regulation. The production of finished goods is the topmost priority, which will help Pakistan in reducing trade deficit. Earlier, Chairman Board of Investment Haroon Sharif welcomed all the members to the first meeting of the council and said that BOI will serve as Secretariat for the CPEC Business Council adding that a dedicated team of professionals has been hired in this regard. He said that BOI is improving its capacity to deal with matters of industrial cooperation with China and urged the members to come up with tangible suggestions in this regard. Secretary Planning Zafar hasan, Project Director CPEC Hassan Daud and representatives from leading associations and companies also attended the meeting. Secretary to the Council, Executive Director General BOI, Ms. Fareena Mazhar briefed the members on the progress in SEZ's and incentive packages under the industrial cooperation.